Did you know that members of the Royal Family are not allowed to wear dark or colorful nail polish to public events? Sorry Queen Elizabeth but I don't think I'd be able to live by that rule! 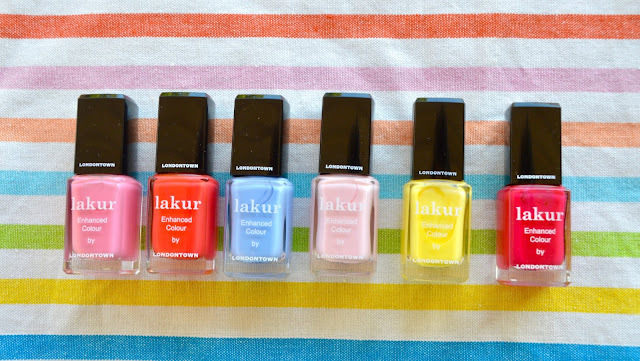 Lucky for me, Londontown offers nail polishes in a fun array of colors in addition to more subdued and neutral colors, so there's something for everyone, even the Royals! Given all of the options, plus the fact that Londontown is vegan, gluten-free, cruelty-free and 9-free (I'll explain that later), imagine my excitement when they asked me to try out some of their nail polishes and review them for my readers! First, I'll talk about the colors because, as you all know, I'm all about color! I tried out the following colors from Londontown, which appear in the order shown in the lineup above: Brit of Love, Piccadilly Square, Amalfi Love, Out of Office, Notting the Fancy, and Guilty Pleasure. I just love the quirky, fun names and how many of them reference the company's British heritage! Also, the nail polish colors in real life are very true to how they are represented on the company's website, which makes finding your perfect shade quite easy! The first color I tried was a yellow shade called Notting the Fancy. Not only was this my first time trying Londontown nail polish but it was also my first time wearing yellow nail polish! Overall, I found that the color was easy to apply and went on smoothly. 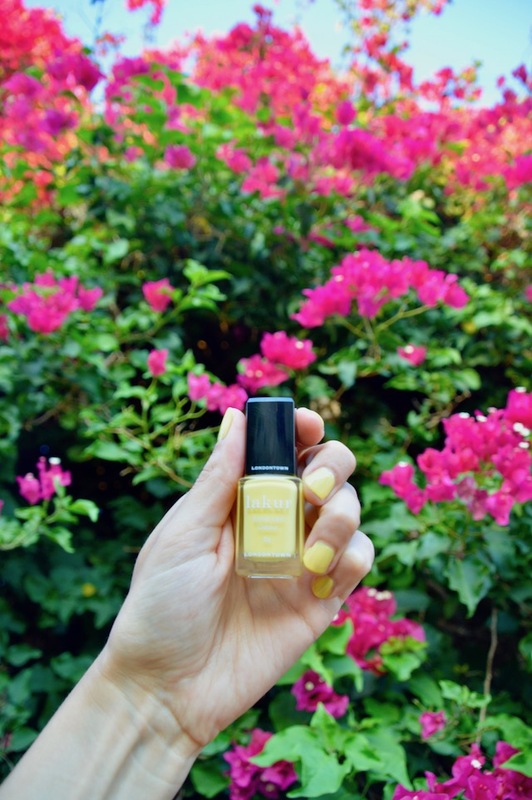 While it's easy to get caught up in all of the fun color options Londontown has to offer, I also love that the brand's polishes are infused with botanicals like vitamin E and rapeseed oil, which help to nourish nails. 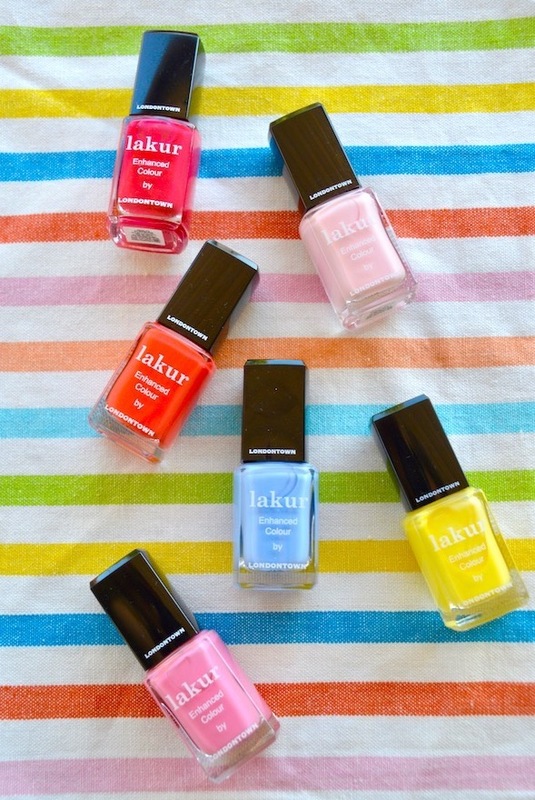 Also, as I mentioned previously, all of Londontown's polishes are 9-free. If you don't know what this is, don't worry, I didn't either! What 9-free means is that the polishes are free of 9 potentially harmful chemicals: formaldehyde, camphor, toluene, DBP (dibutyl pthalate and phthalates), formaldehyde resin, xylene, ethyl tosylamide, parabens, and lead. Londontown also offers a line of nail care products. 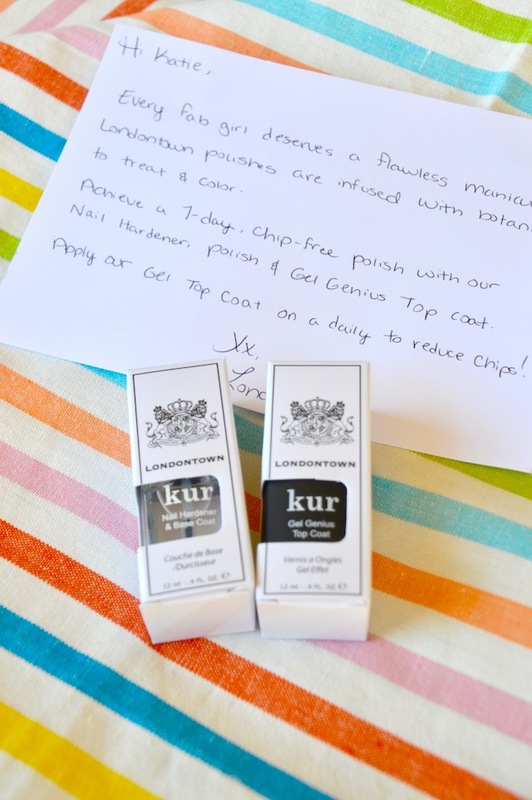 As you can see from their letter below, it's recommended to use their nail hardener and base coat before applying the polish and then use their Gel Genius top coat to keep the color and shine looking fresh and chip free. After applying both of these to my nails, my polish is still going strong! Overall, I'm really happy with the quality and longevity of the Londontown line of nail polish! I'm looking forward to trying out the other colors they sent me in the future and pairing them with some colorful outfits, which shouldn't be difficult because I have just about every color of the rainbow in my wardrobe! Londontown is truly a quality product that's fit for a queen or for a Los Angeles girl such as myself!